The Colorado Bill of Sale Form is a legal document that would accompany the sale or trade of a vehicle, vessel, firearm or any personal item between two or more sellers and buyers or traders. These document will provide proof that a sale or trade has taken place legally and in full agreement of all parties involved. In some cases, these forms require a part of the registration process of vehicles, vessels, firearms and more items where required by state and/or Federal law. Boat Bill of Sale – To be used to provide proof that a legal transaction has taken place between two parties in the sale and purchase details the sale of a boat/vessel in the state of Colorado. General Bill of Sale – Offers proof that a legitimate sale or trade has been negotiated and placed into writing, reflecting the cost and other details. Gun Bill of Sale – This is a legal document that will provide information with regard to the sale or trade, as well, the transference of ownership of a firearm between two parties. 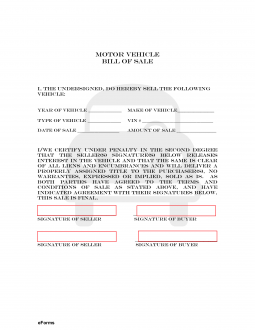 Vehicle Bill of Sale Form – Is a legal document offering proof of sale and transference of ownership of a vehicle. Registrations are valid from Jan. 1 to Dec. 31 each calendar year. VIN verification form if required (see C.R.S. 24-32-3323, 38-29-122, 42-3-105(l)(c), 42-6-107(l)(b).